New glow Shift tachometer - dodgy?? 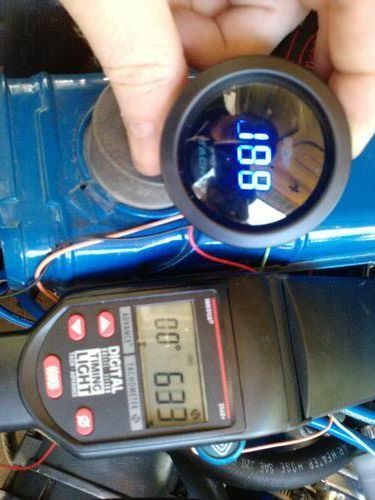 › New glow Shift tachometer - dodgy?? I was pretty excited when the Glow Shift tacho that I bought on eBay turned up yesterday. I thought I'd test connect it before installation in case it was faulty or something, so I wired it up under the hood - red to positive, black to negative, green to the coil negative, and tacho switch set to 8 cylinders. Started the car and the tacho reads approximately three times the actual revs as can be seen by the attached picture when compared to my timing light The pic shows the digital read-out at about 180 (x10) and the timing light read-out at around 600 with the engine running at slow idle. Revving the engine caused the digital display to rise as expected, but still way above what it's supposed to. One by one I tried every other cylinder number setting on the gauge, but the revs displayed only got higher and higher rather than lower. The only thing I can think of is that the tacho instructions say to connect the green wire to the "tachometer source wire" whereas I have connected it straight to the coil because I don't have a "source wire" available. Any suggestions? ?